Make brownie batter as directed on boxes. Stir in 1/2 cup chocolate chips. Spread in pan. Bake 22 to 25 minutes or until toothpick inserted 2 inches from side of pan comes out almost clean. Cool completely, about 1 hour. In large bowl, beat Filling ingredients with electric mixer on medium speed until smooth, scraping down sides of bowl frequently. Spread evenly over brownies. Refrigerate about 2 hours or until set. 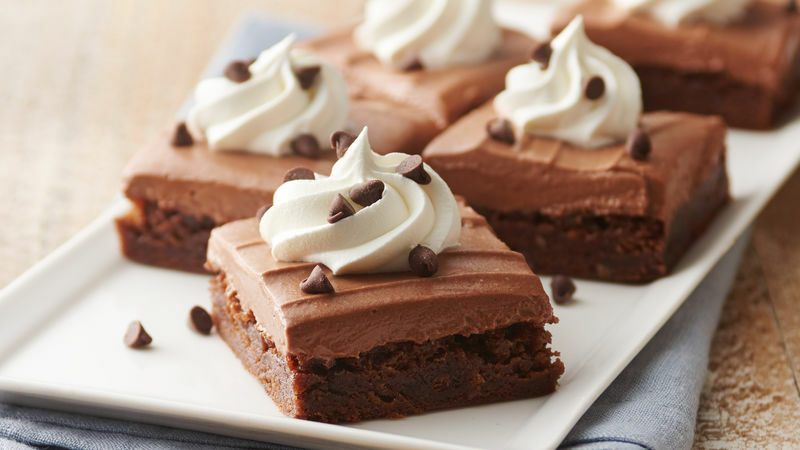 When ready to serve, cut brownies into 6 rows by 4 rows. In chilled medium bowl, beat 1 cup whipping cream with electric mixer on medium-high speed until slightly thickened. Reduce speed; beat in 3 tablespoons icing sugar and 1/2 teaspoon vanilla. Increase speed; beat mixture until stiff peaks form. Spoon whipped cream into decorating bag fitted with 1/2-inch star piping tip. In centre of each brownie, apply steady pressure to bag while squeezing, and pipe in tight circle to make rosette flower about 1 1/2 inches in diametre. Stop squeezing, and quickly lift bag off. Garnish rosettes with chocolate chips. Store loosely covered in refrigerator. No decorating bag? Fill large resealable freezer bag; cut off one bottom corner, and squeeze whipped cream out to decorate.